Thin Lizzy featuring Scott Gorham (Guitar), Brian Downey (Drums), Darren Wharton (keyboards), Vivian Campbell (Guitar), Marco Mendoza (Bass Guitar) and Ricky Warwick (Lead vocals/Guitar). 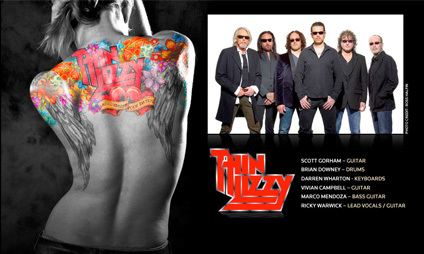 Thin Lizzy is one of Rock Music's most recognizable names. The fiery Dublin band exploded onto the scene with a fresh sound, look and attitude. Lead by the incomparable Phil Lynott, the band reached many peaks and influenced generations of musicians with classic tracks such as "Jailbreak", ‘The boys are back in town", "Still in love with you", "Cold Sweat", "Emerald", "Don't believe a word". Most rock historians would agree the pinnacle of their commercial success was in 1983, followed by the bands' premature demise, as they played their last gig in September of 1984. Just two years later, the world was shocked when singer/bassist and founding member Phil Lynott passed away at the age of thirty six. Twenty four years have passed, the world has changed, but the amazing body of work that is Thin Lizzy still retains all of it's vibrancy and influence. A new line-up has formed to take Lizzy's music to a whole new generation of music fans, led by alumni Scott Gorham, Brian Downey and Darren Wharton (all of whom played in Thin Lizzy with Phil Lynott). The stellar line-up is completed by Def Leppard's Viv Campbell (guitar), Bassist Marco Mendoza (Whitesnake, Ted Nugent) and The Almighty's Ricky Warwick on vocals and guitar.